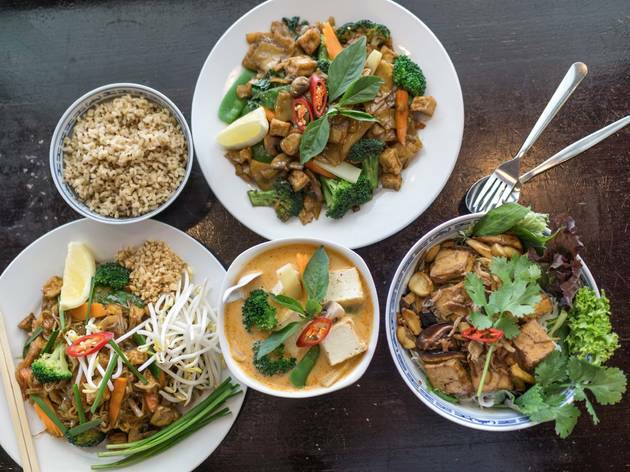 You know a place has its meat-free options sorted when you find you almost prefer the vegan version of your favourite Thai dish. The massaman curry here is a ripper. We don’t know how but they’ve managed to get those deep savoury notes into the creamy sauce and then padded it out with potato, tofu, mushrooms, snow peas, broccoli and peanuts. It also comes with a side of nutty, filling quinoa and brown rice so that you’re filled to the corners for just shy of $14. Satay skewers of tofu and button mushrooms are an excellent substitute for the meaty versions of this South East Asian street snack, and do not leave without a little parcel of sticky rice wrapped around a sweet taro filling with a slick of coconut cream over the top. These guys get a gold star for their inclusive attitude. 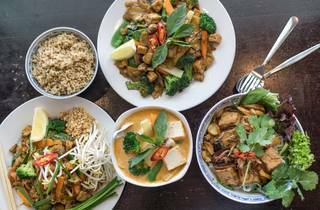 Yes, they serve meat, but they have a vegan version of almost everything on the menu, which makes group dining blissfully easy. Mon-Fri 4.30-10pm; Sat, Sun noon-10pm.